Written on 22 December 2013 . Kempo, Vovinam, Taekwondo and Muay teams helped Vietnam surpass the gold medal target at the 27th SEA Games in Myanmar. In Kempo, Do Hong Ngoc won a gold medal in the women’s 48 kilogram weight free sparring event after defeating her Indonesian rival Dian Pertiwi Said, while Le Duong Lan Phuong and Tran Thi My Duyen brought in a second gold medal. After losing to Yunita Gelu from Indonesia, Nguyen Thuy Duong pocketed a silver medal in the women’s 51 kilogram weight free sparring event. Huynh Thanh Thuy and Nguyen Kim Nguyen each grabbed a bronze medal in the women’s 54 kilogram and men’s 55 kilogram weight free sparring event, respectively. 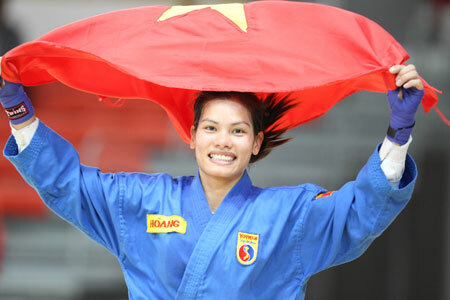 Athlete Nguyen Thi Kim Hoang reaped the fifth gold medal for the Vietnamese Vovinam team after defeating Laotian athlete Khammai Lathsavong by 4-1 in the women’s 55 kilogram weight event, while Ho Minh Tam won the 72nd gold medal for Vietnam after beating Sengchanh Sivongas from Laos, in the men’s 65 kilogram weight event. Vovinam athlete Huynh Khac Nguyen gained a silver medal for Vietnam in the Vovinam Four Element Staff event. Vovinam athletes Pham Thi Bich Phuong, Mai Dinh Chien, Tran Ngoc Nam, and Tran The Thuong only earned a bronze medal in the weapons self-defense woman’s event, while Cambodian athletes won a gold medal and a silver medal. Vovinam athlete Tran The Thuong won a bronze medal in the Five Gated event. In Taekwondo, Nguyen Trong Cuong claimed a gold medal in the men’s 87 kilogram weight division after knocking out Cambodian rival, Sophal Mao, in the very first round of the final; whereas Dinh Quang Duc did not perform well in the decisive round, losing to Kristopher Robert Uy from the Philippines by 6-7 to obtain a silver medal. Bui Yen Ly and Nguyen Thi Ngoc brought in two gold medals for the Vietnamese Muay team in the women’s 51 kilogram weight division and 60 kilogram weight division events, respectively. Both defeated two Burmese rivals in the final. However, referees failed to show impartiality to Burmese athlete Hla Yin May in the final battle against Bui Thi Quynh in the women’s 48 kilogram weight division Muay event, although Bui Thi Quynh performed well and overwhelmed her competitor during the entire match. Phan Thi Ngoc Linh was the next victim of the referees in the Muay event. Despite being world champions for several years, Linh only took home a silver medal in the women’s 57 kilogram weight division due to their unfairness. Nguyen Ngo Trieu Nhat also won a silver medal in the men’s 51 kilogram weight division Muay event after being defeated by Mohd Lokman Akini from Malaysia in the final. In the men’s 57 kilogram weight division Muay event, Nguyen Phu Hien was not able to surprise the audience in the final against Pisal Iamsiri of Thailand, bagging only a silver medal. Judo athlete Dang Hao unexpectedly failed to defend his title, losing to Burmese rival Naing Soe, in the men’s under 100 kilogram weight class Judo event, collecting a silver medal. Nguyen Thi Nhu Y also acquired a silver medal for Vietnamese Judo team in the women’s under 78 kilogram weight class event. Vietnamese female volleyball team received a silver medal for a quick loss of 0-3 against the Thai team. This is the seventh time that the Vietnamese team has trailed the Thai team. Le Tien Dat took a silver medal in the men’s singles table tennis event as he was overshadowed by his Singaporean rival Jian Zhan, who is the current world number nine. Nguyen Xuan Loc, Phan The An, Vu Khang Duy and Cao Phu Thinh only got a bronze medal in the men’s triple petanque event after losing to the Thailand team in the semifinal. Vietnam now ranks third in the medals tally with 244 medals in all, with 73 gold medals, 85 silver medals and 86 bronze medals at the 27th SEA Games.